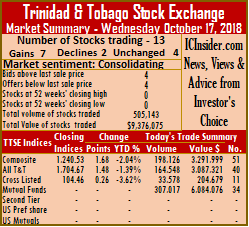 Stocks mostly rose in trading on the Trinidad & Tobago Stock Exchange on Wednesday, with the prices of 7 securities rising, 2 declining and 4 remained unchanged. 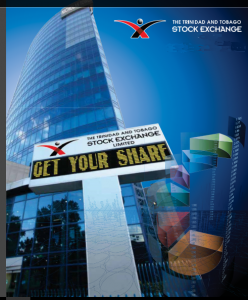 The market ended trading of 505,143 shares at a value of $9,376,075 compared to 530,843 shares at a value of $24,133,808 changing hands on Tuesday and ended with 13 securities changing hands, against a same number trading on Tuesday. Trading closed, with the Composite Index rising 1.68 points to 1,240.53, the All T&T Index adding 1.48 points to 1,704.67, while the Cross Listed Index rose 0.26 points to close at 104.46. Stocks closing with gains| Clico Investments rose 49 cents and ended at $20, with 307,017 stock units changing hands, Guardian Holdings closed with a gain of 1 cent and completed trading 124,882 units at $16.90, National Flour gained 5 cents and ended trading 15,000 units at $1.70, NCB Financial Group finished trading with 5 cents and settled at $6.15, after exchanging 25,980 shares, Prestige Holdings closed with an increase of 2 cents and completed trading at $7.54, with 410 units, Trinidad & Tobago NGL added 10 cents and settled at $29.40, after exchanging 16,700 shares and West Indian Tobacco closed with a rise of 1 cent and completed trading of 971 units at $90. Stocks closing with losses|Massy Holdings traded with a loss of 8 cents and closed at $46.92, after exchanging 3,153 shares and Scotiabank fell 4 cents and completed trading of 2,175 units at $64.85. Stocks trading with no price change|JMMB Group ended at $1.70, after exchanging 2,248 shares, Republic Financial Holdings concluded trading at $106, after exchanging 611 shares, Sagicor Financial ended at $7.69, with 5,350 stock units changing hands and Unilever Caribbean ended at $25.50, trading 646 stock units.